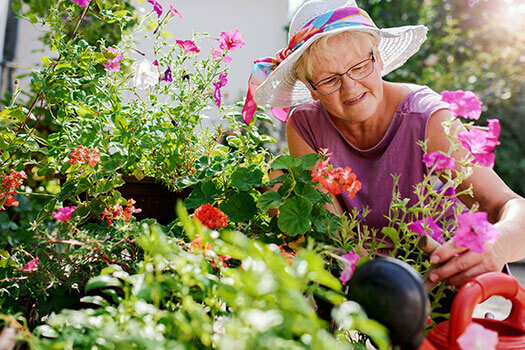 Gardening has mental and physical benefits for seniors. While the physical side of gardening is more obvious, the cognitive component shouldn’t be underestimated. The gardening process, from planning to planting to tending, is a wonderful way for seniors to stay physically healthy and mentally sharp. Here are a few benefits of gardening in the senior years. Gardening may not be as vigorous as an aerobics class or a yoga session, but this outdoor activity gets the muscles moving and the heart pumping. This light cardiovascular exercise, which involves lifting, digging, and bending, can help seniors stay strong, mobile, and flexible. Seniors should remember to stretch before and after they tend to their gardens. They should pay special attention to their hands and fingers, as doing detailed work in a vegetable garden can lead to hand cramps. From tending to their gardens to managing basic household chores, seniors may need assistance with an array of tasks. Rhode Island elder care experts are available to provide high-quality care to seniors on an as-needed basis. From assistance with mobility and exercise to providing transportation to the doctor’s office and social events, there are a variety of ways professional caregivers can help your aging loved one continue to live independently. Spending some time in the sun helps seniors produce some much-needed vitamin D. Sunshine also boosts the body’s production of serotonin, a neurotransmitter that regulates mood. People with low serotonin levels are at greater risk for depression and other emotional health issues. For seniors who feel depressed or lethargic, spending time outside tending to a flowerbed can provide emotional and mental relief. Sunlight isn’t the only aspect of gardening that increases serotonin production. Dirt contains Mycobacterium vaccae, which boosts the production and metabolism of this important neurotransmitter. Gardening isn’t just a physical activity. It also requires skill and foresight. Gardeners have to plan out each plot in their garden, tend to the plants at regular intervals, and keep new growths alive with skill and care. When these cognitive tasks are combined with motor skills, it forces the brain to work in multiple ways at once. This forges new neural pathways, which makes gardening an excellent way to stave off dementia. Dementia can be challenging for seniors to manage, but they can maintain a higher quality of life with the help of professional dementia home care. Rhode Island seniors can benefit greatly from the Cognitive Therapeutics Method (CTM), an activities-based program designed to promote cognitive health and delay the onset of dementia. CTM is included at no additional charge with any of the in-home care plans provided by Home Care Assistance. Studies show gardening is an effective method of stress relief. Seniors may find the repetitive movements of gardening soothing, or they may find relief through the aerobic component. Gardening can regulate cortisol levels in the body. This hormone performs necessary functions, but when cortisol levels get too high it can lead to undue stress. Because gardening lowers cortisol production, it can relieve feelings of anxiety. Most of the benefits of gardening come from the process. There are the physical benefits of planting and tending and the cognitive benefits of planning and problem solving. When seniors grow produce, their hobby also results in healthy homegrown food. Encourage your loved one to grow a vegetable garden filled with easy-to-grow produce like cucumbers, tomatoes, carrots, and zucchini. Gardening and other physical tasks around the house may be difficult for some seniors to accomplish. If your senior loved one needs hourly or 24-hour care, Rhode Island Home Care Assistance can help. Our caregivers can assist with exercise and mobility, prepare nutritious meals, provide timely medication reminders, and help with a wide array of other important daily tasks. To create a customized in-home care plan for your elderly loved one, give us a call at (401) 284-0979 today.